Chris Wagner knew a rental increase was inevitable when he went to meet with Burlington Parks & Recreation to discuss a new three-year contract for the Burlington Farmers’ Market at City Hall Park. “At the end of our contract we always sit down and discuss the rent,” says Wagner, the market’s manager. Given that the market has grown significantly over the past few years, and has been paying just $3600 to use the park for its entire season, he expected the annual rent would increase to as much as $5500. Its vendors did. In total, the 58 sellers brought in over a million dollars, which averages out to more than $17,241 each. But, Wagner warns, “Those are gross figures. That’s not what the farmers take home.” In addition to fuel, labor costs, marketing materials and market membership fees, vendors have to shell out for insurance and are greatly affected by bad weather. Although Gross and BFM president Hank Bissell have discussed phasing in the increase over three years, members of the market are still incensed at the idea of paying so much more, particularly because they bring so many consumers to downtown Burlington. On that point, the BFM and Parks & Rec agree: “We want to keep the market downtown. We want to keep it in the park,” says Gross. 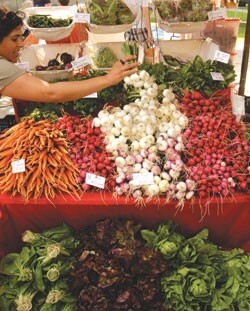 Speaking of markets: Next fall, Shelburne will join the growing list of towns with a late-season farmers’ market. The monthly gathering will take place at the Shelburne Town Center Gymnasium. Dates and vendors have yet to be announced.